Residential trash collection is provided weekly through a contractor hired by the City. A contract between Rumpke and the City of Springdale has been established at no additional cost to the homeowner. Recycling service is provided by Rumpke and is free to the residents of Springdale. Recyclable items can be placed in red Rumpke bins or totes and placed at the curb on the same day as trash service. 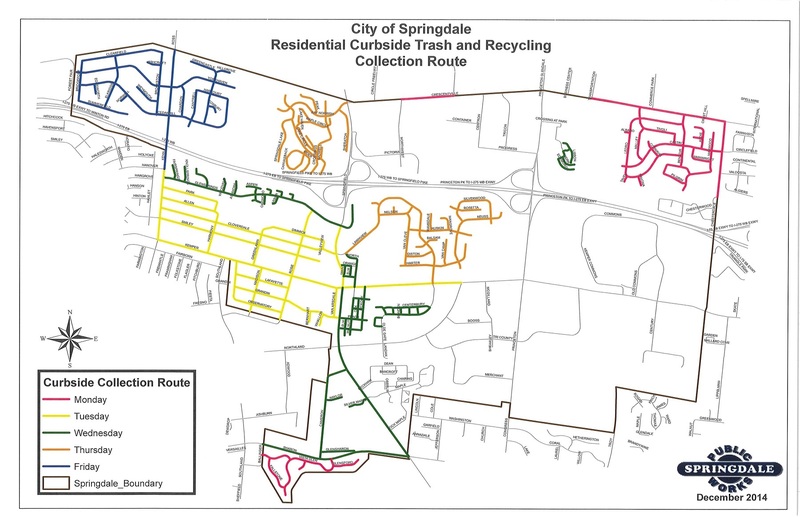 Residents may request up to two (2) of the red recyclable bins free of charge through the City of Springdale. Residents with larger volumes can also request a recyclable tote from Rumpke for a small additional fee. Call (513) 346-5700 to setup service, for additional information regarding trash or recycling services, and to order your red Rumpke recycling bin. Residents and businesses can also bring recyclable materials to our drop off container area. Drop off bins are located at 335 Northland Boulevard, Springdale, OH and can take items as referenced above. No plastic bags can be accepted. If you change your own oil in your vehicle, the City of Springdale has a drop off location available for waste oil recycling for the residents of the community. We use this waste oil to help heat our fleet services area. The used oil is recycled in our waste oil heater. Most automotive part supply places will also accept waste oil. If you are cleaning out your basement or garage, or making improvements around your home, you can borrow a truck from the City to get rid of debris. Click the button below to find out more about the program and to reserve a truck.